See all the latest pictures of Team SA competing in London. London - Having spent years fighting for the right to race his own blades, Oscar Pistorius is now complaining about a rival's artificial limbs after a stunning loss at the London Paralympics on Sunday. The "Blade Runner" had never been beaten over 200m in Paralympic competition until Brazilian sprinter Alan Fonteles Cardoso Oliveira came storming down the home straight past him to win by 0.07 seconds. The icon of the Paralympics had been dethroned and wasn't taking it lightly. Pistorius immediately raised concerns with Paralympic officials that Oliveira's surge came through rule-bending blades helping with the late strides. Pistorius, who won a legal battle to compete wearing carbon-fiber blades alongside able-bodied runners at the Olympics last month, suggested that Oliveira ran with longer prosthesis than should be allowed. Oliveira won gold in 21.45 seconds after overtaking Pistorius at the line at Olympic Stadium in the T44 classification race in front of a capacity 80 000-strong crowd. "Not taking away from Alan's performance - he's a great athlete - but these guys are a lot taller and you can't compete (with the) stride length," Pistorius said in a broadcast interview. "You saw how far he came back. We aren't racing a fair race. I gave it my best. The IPC (International Paralympic Committee) have their regulations. The regulations (allow) that athletes can make themselves unbelievably high. "We've tried to address the issue with them in the weeks up to this and it's just been falling on deaf ears." While Pistorius tried to be more magnanimous later, he still claimed it was "ridiculous" that Oliveira could win after being eight metres adrift at the 100m mark and deny him a third straight 200m gold. "He's never run a 21 second-race and I don't think he's a 21-second athlete," Pistorius said. "I've never lost a 200m race in my career." "Ask anyone out there - does it look weird? Does it look out of proportion?" Fourie said. "I think 99 percent of people are going to tell you, 'Yes it does.'" "If they are within the rules you can't fight the athlete, so you're going to have to fight the formula and fight the rule if we're going to do anything about it." Oliveira insisted he had not broken the rules, and expressed disappointment with Pistorius's criticism. "He is a really great idol, and to listen to that coming from a really great athlete is really difficult," Oliveira said through a translator. "I don't know who he's picking a fight with, it's not with me." The 20-year-old Oliveira was backed by Paralympic leaders. "There is a rule in place regarding the length of the blades, which is determined by a formula based on the height and dynamics of the athlete," the IPC said in a statement. "All athletes were measured today (Sunday) prior to competition by a classifier and all were approved for competition." Paralympic officials, including the top medical official, agreed to meet with Pistorius after the race. "He wanted to voice his concerns and we listened to those concerns," said IPC spokesperson Craig Spence, who was at the meeting. "The IPC will meet with Oscar at a later date to discuss his concerns once the emotion of tonight is out of the way." The second half of Pistorius's year in London is not running to script. 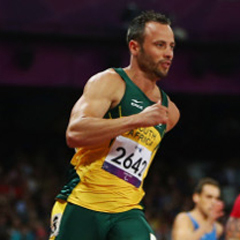 At the start of last month, Pistorius reached the 400m semi-finals and the 4x400m relay final. Competing at the Olympics was some achievement alone, though the medals were meant to come at the Paralympics. But Oliveira could stand in the way of Pistorius and glory for the rest of the games, competing in all of his events. Next up is the 4x100m relay on Wednesday before Pistorius defends his titles in the 100m on Thursday and 400m on Saturday. Earlier on Sunday in the Olympic Stadium, a Ukrainian athlete who was stripped of her Paralympic discus title after an error by scorers was told she would be allowed to keep her gold medal. Mariia Pomazan had been relegated to silver after officials said the placings from Friday's F35/36 final were incorrect because an outdated scoring system had been used. China's Wu Qing was promoted to first place. However, the IPC that in the "spirit of fair play," Pomazan would be allowed to keep her gold although it would not be added to Ukraine's medal tally. She said she was "extremely emotional" and called it an "unforgettable experience."